After my little experiment to find out the water weight of white and yellow glue - weight which would be lost as the rocket dried - I got curious about some other properties of adhesives used in model rocketry, and wondered if I could test them out. 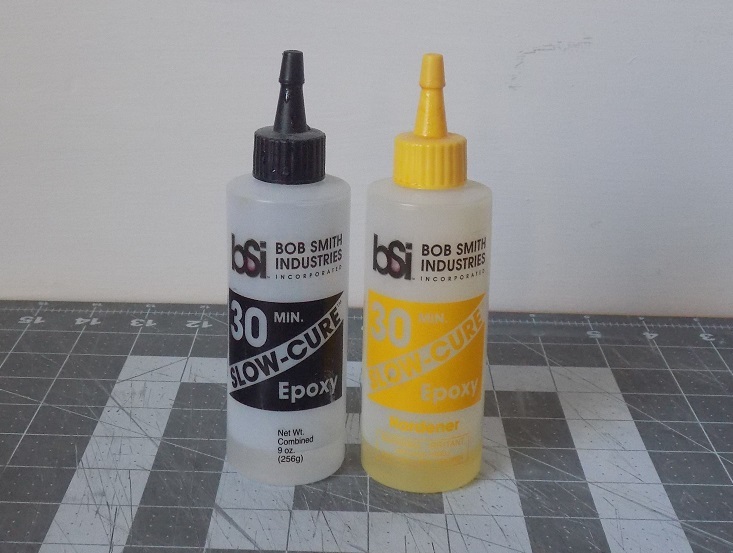 I started thinking about that epoxy - Bob Smith Industries hobby epoxy - which I and many other first-time epoxy users turn to when building larger projects. BSI epoxy (for short) is easy to find, available in many hobby shops and online vendors. It's simple to use for an epoxy, as you mix the resin and hardener together in equal batches by volume. You can buy a small amount of it relatively cheaply. It's sometimes re-branded with other names - Aerospace Specialty Products, or Great Planes, for example. You can find fast cure and longer cure versions. I've used BSI epoxy for a number of applications. When building my Estes Leviathan, which I used for my high power Level 1 certification flight, I used it because I wanted to add strength by adding internal fillets - reinforcing fillets of adhesive inside the rocket, much as you would have at the root of a fin on a model rocket, but at the base of the long tab which runs through the body of the rocket and attaches to the motor mount tube (this is known as through-the-wall construction). Internal fillets on the Estes Leviathan. The fins are through-the-wall, meaning a tab goes through the body tube and is attached to the motor mount tube. I built this to fly on a high thrust H motor, so I reinforced it with internal epoxy fillets. Once all the epoxy had cured, I put on the aft centering ring and glued it in place. The whole rocket is very strong. With my Quest Big Dog, I used BSI epoxy to install the motor mount, because the centering rings were a little too small. The outer diameter of the rings was smaller then the inner diameter of the body tube, leaving a slight gap. Since epoxy is nice and thick, I used that to fill the gap. And on a few occasions, I've used BSI epoxy to make the fin fillets on low or mid power rocket builds. In these instances, the epoxy was mixed with a filler material called microballoons, a powdery substance which is actually made of microscopic spheres or bubbles of glass. Fillers like these make the epoxy stiffer, so you can form a fillet shape which won't sag, making a nice, round fillet when the epoxy cures. It also makes the epoxy much lighter in weight, and easy to sand if you need to. While all the rockets I'd built with epoxy fillets turned out very pretty, a few of them had a major drawback - after a flight or two, there were long cracks all down the fillets of at least one side of the rocket. It seemed that the epoxy fillets were rather brittle, and only light pressure on the fins caused them to crack. So I wondered if I could figure out a way to investigate a few more properties of the glues I use. Specifically, could I examine the brittleness or flexibility of the adhesives? What about the strength? Now, I'm going to state here again, this is not a terribly scientific test. Frankly, I don't have the equipment to definitively answer some of these questions. Or, at least, I don't have much data. But though playing around with these glues, I was able to satisfy my own curiosity about the flexibility or brittleness and the adhesive strength of my Elmer's white glue, Titebond II yellow glue, and Bob Smith 30 minute epoxy, both on its own and mixed with microballoon filler. First, I should say that there are many, many different brands and types of epoxy, with different properties, strengths, uses, etc. This is obviously not an exhaustive test. But BSI epoxy is a pretty common hobbyists adhesive. It's great for certain applications, but I'd like to address those rocketeers who feel they need to reach for the epoxy for all their builds, large and small. We've established that epoxy is heavy in the previous post. Using it on an Estes Alpha or Big Bertha will work, but it's more weight than you want to add. Furthermore, it's not necessarily "better." If you're building a low power model rocket made of paper tubes and balsa fins, white or yellow glue is usually the adhesive you want. Some rocketeers want to make their rockets "bulletproof," so they figure epoxy is the glue they want. Well, first of all, model rockets shouldn't be indestructible. Destructibility is a safety feature! Also, epoxy may not actually make for a stronger bond. Okay, let's take a look at what I did. Remember, this is grain of salt time. If you have doubts about my methods or findings, that's fine. I encourage you to test things out for yourself - it's easy! I decided the easiest way for me to get an idea of how brittle filled epoxy is would be for me to simply take a hardened piece of it, and - by hand - see how much it could bend or flex before breaking, as well as how hard it would be to snap it in two. Included here are screen captures of the video I recorded, and you can see the whole video at the end of the post. Since I'd already looked at the water weight of white and wood glue, as well as the fact that epoxy loses no weight as it cures, I decided to continue comparing these adhesives. What I needed were dried, hardened sticks or batons of glue. These were easy enough to make. I then poured a line - or fillet - of each epoxy into the waxed paper. For the yellow glue and white glue, I simply poured a line into the waxed paper. Then I let everything dry or cure. Because white and wood glue are mostly water, they shrink as they dry. I was left with a very thin bit of glue after one application. So, while my epoxy batons were ready once they had cured, I had do make the white and yellow glue sticks in several applications, pouring a new fillet on top of the first once it had dried. This took several days for everything to dry thoroughly and for me to have a thick enough glue baton to actually handle. So, you can see that each baton was different. I didn't measure an amount of epoxy for the two epoxy fillets, so they were uneven and of different thicknesses. The white and yellow glues were built up in layers. I would not be comparing these fillets to one another, so much as simply seeing what each one would be like on its own. When all batons were ready, I peeled them from the waxed paper. First, holding each between my thumbs and first fingers, I tried to see how easily each one would flex. Then I tried snapping the baton in two to see how easily it would break. Here's part of what I mean by not having much "data" - I am doing this by hand, so I can't apply any numbers to what happened. But you can see the video for yourself, and I can report on what I found. The first example was the Elmer's white glue baton. Here was my first surprise. Of the three adhesive samples (that is, not including the epoxy with microballoons), this was the least flexible. It would flex a little in one direction, but not the other. It took a bit of effort, but the glue baton snapped without distorting much at all from its original shape. That's not to say that I would call it brittle, though. While it was the easiest of the three adhesive batons to snap in two, it did require some force on my part, and though you may not be able to tell from the video, it actually cut my finger in two places because of the sharp edges on the glue fillet! So, Elmer's white glue adds the least amount of weight, as we saw from the previous blog post. And it's the least flexible. Now, I don't know whether that lack of flexibility is an advantage or a disadvantage, or perhaps even neither. While you could argue it might add rigidity to a rocket's fins, making the rocket stronger, you could also say that being inflexible might increase the risk of a fin breaking off during a hard landing. Then again, you use such a thin layer of glue when building a model rocket, perhaps it's just too thin for flexibility to be a factor. Next was the Titebond II yellow glue. Here was another surprise. Whereas the white glue was almost totally inflexible, the yellow glue was so flexible I couldn't break it! I could bend it back and forth like a Twizzler's, but the glue baton stayed intact. It's not until the end of the video where I manage to break the Titebond II baton - by twisting it around and around until it basically tears apart. So, the yellow glue is the second lightest in weight of these adhesives, and is ridiculously flexible. Again, maybe an advantage, maybe not. Next was the pure, unfilled epoxy fillet. This, too, surprised me. While I expected it to be quite brittle, it was in fact somewhat flexible. More so than the white glue baton, in any case. It was also harder to break than the white glue - but of course, it was a thicker stick, so take that as you will. The Bob Smith Industries unfilled epoxy adds the most weight of all three adhesives, and is somewhat flexible. Finally, I tried the fin fillet material - the Bob Smith epoxy filled with microballoons. Since these are made of glass, I put on some gloves to protect my skin in case there were any shattering. This turned out to be unnecessary. Because the microsphere filler makes the epoxy less dense, this fillet was much lighter. And, unsurprisingly, it was very brittle. It barely flexed at all before breaking, and was quite easy to snap in two. Interestingly, the break was very clean with perfectly smooth and flat ends. This is why microballoon filler is good for thickening and lightening epoxy for certain applications, but you wouldn't want to glue fins on with it. In boat building, microballoon filler apparently makes epoxy really good for non-structural fillets. I don't know much about boat building, but it makes sense. I wouldn't want this stuff to have to take much stress. Next, I wanted to see if I could figure out a way to test the adhesive strength of the white glue, wood glue, and plain epoxy. In other words, I wanted to see, if you used one or the other glue to attach your fins to a model rocket, which fins might break off most easily? Which might be the strongest? What I needed to do was to glue some fin stock onto a body tube with each type of glue, and then try to break the fin stock off. But just doing that alone wasn't going to show anything. I might get an idea myself of how strong one bond would be over another, but I would have no real numbers to attach to it, and it wouldn't be much use here on the blog for me to say "I tore off the fins, and X tore off easier than Y." What I came up with wasn't perfect, but it did give me some idea of how the adhesives compare, and it gave me some numbers - kind of. I made three "fins," 1/8 inch thick, with a three-inch chord (from the leading to trailing edge) and a 2-inch span (from the root to the tip). I took sections of BT-60 body tube and gave them a very light sanding. Body tubes are kind of slick, and to get a good grip, it's not a bad idea to take a bit of the shine off them for better adhesion - especially for epoxy. I attached the fins to the body tubes and allowed them all to dry for several days. Glue was applied to the root edge only, and there were no fin fillets used. I would use my digital scale as a kind of gauge to measure roughly how much force I was applying as I pressed the tip of each fin to the scale at an angle, and slowly pressed until the fin snapped off. I have read of wood glues that they are "stronger than the materials they are bonding," when used on wood and or paper. I've also heard that the paper body tube will fail before the glue does. I won't say that I found any proof to the contrary. But I did find this: while each fin broke off with a different amount of force, in each case, there was paper body tube still attached to the root of the fin. It did not seem that the adhesive had separated in the middle of the glue layer. So, perhaps some glues do not fail as easily as the paper body tubes, or perhaps the failure is partially the materials, partially the adhesive. Anyway, on to the experiment. I slipped a tube coupler into the body tube to give it extra support. Holding each piece to the scale at about a 25-30 degree angle, I slowly pressed until the fin separated from the tube. I videotaped each example in the hopes of slowing down the video and seeing how much force, in grams, I was applying at the moment the fin snapped off. Again, it's important to take this experiment with a grain of salt. First, of course, I was doing this by hand. It's impossible to say how well or poorly I was holding the fins at the same angle or pressing with the same motion each time. And a digital scale isn't really meant for this thing. As you'll see in the video, it takes a moment for the reading to catch up with what's happening. I started with the white glue. I pressed the fin slowly against the scale, and when it began to tear, the scale read 210 grams. When it finally snapped, the scale reading had reached 460 grams. In this and other cases, after the fin broke off, the scale reading jumped up a couple hundred grams momentarily. Either the scale was catching up to the pressure I had applied a moment later, or maybe I pressed down on it with the body tube or something. The Titebond yellow glue withstood a bit more force, with the fin breaking off at 778 grams. Finally, the Bob Smith epoxy, which broke much more easily. Even if the white and yellow glues were close enough to take into account any discrepancy of the pressing motion on my part, the epoxy snapped off with very little pressure, with the tearing sound occurring at only 178 grams. In the video, it's much more apparent from the sound how easily it broke off. In an effort to be more thorough, I decided to run the test again, this time trying to shear the fins off at the root, rather than breaking them off by pressing on the tips. I used my razor saw miter box as a support and clamped the fins down. The rig I came up with to try shearing the fin off at the root. The body tube is at the top of the picture in this screen capture. This test turned out to be kind of useless. Shearing the fins off at the root was so hard it was nearly impossible. In each case, I exerted somewhere between 8-12 kilograms of force, pushing down on the body tube with my weight and resorting to twisting the piece in an effort to break the fin off. I squashed the tube coupler inside the body tube. I worried I might injure myself! The yellow glue withstood the most force by far, exceeding 12 kilograms of pressure at one point. But since I had to twist and press the piece, I don't feel that the shear test gave very reliable information. Still, I found the fin tip break test to be at least somewhat enlightening. So, here's what I found, just using the single example of each adhesive, and the method I used and the way I used the adhesive (more on this in a moment). I'm not saying it's completely reliable, but it is what it is. The Titebond II yellow wood glue was the strongest bond, was reasonably light in weight, and also the most flexible. The Elmer's Glue All white glue had a bond which was a close second to the Titebond, was the lightest in weight, and had the least flexibility. The Bob Smith Industries 30 minute epoxy had the weakest bond, was the heaviest in weight, and had some flexibility. Also remember that this question of weight and strength is partly aimed at beginning rocketeers who might be tempted to buy some expensive epoxy to make their Estes Bull Pup or Hi Flier XL "better" or "stronger," when actually the weight, messiness, and expense of epoxy may not give you better results. In fact, your model rockets will usually be fine no matter which adhesive you reach for. I also don't want it to sound like I'm dismissing epoxy in general, or Bob Smith epoxy in particular. First, there are many different epoxies with many different properties. When building rockets with certain materials - fiberglass, carbon fiber, or a plastic-like material called "quantum tubing" used in kits by Public Missiles, Ltd. - epoxy is a must, as wood glue will not bond to these materials. And Bob Smith is fine stuff if you don't want to go out and buy the really fancy stuff - as I said before, I've used it in my builds before and I will use it again. If used properly and for the right purpose, it'll do a great job. Also, the difference in strength between any of the two adhesives - especially white and yellow glues - is probably not enough to make a difference if you have a hard landing. If you're landing just hard enough to break something when using white glue and not yellow (which would be a really tiny margin, I suspect), then you probably just need to be more careful about recovery - switch to a parachute instead of a streamer, or pack your chutes so they come out more reliably. So, why did I do all this? Well, in this hobby, it's possible to hear a lot of conflicting information about a lot of things. It can be hard to know what's correct, and what's just opinion. One of the many interesting things about this hobby is that you can test things out! You don't necessarily have to take someone's word for it. Don't get me wrong - there are lots of really knowledgeable people out there who'll give great advice. And I don't mean this to be any kind of last word on glue. In fact, I don't even mean for you to take my word for it! If you see a flaw with how I've tried these little informal tests and can think of a better method - let us know! All I've done is the best I can with what I have to try and figure a few things out here. The fact is, any of these adhesives will work for most builds, whichever you choose. Sometimes a rocket will land hard, and you'll think it definitely should have broken, and it comes out unscathed. At other times, a rocket with well-glued on fins will have a soft landing, yet somehow a fin will pop off (as happened with my beautiful Estes Photon Probe after a soft landing on grass). So take what I've done here however you want, and decide for yourself. As long as the rocket is safe to fly, it's fine - you are the rocketeer, and you make the decisions. If you have trouble watching it on the blog, you can follow this link to it and see it directly on YouTube. - Titebond is great stuff, I use it all the time for wood/paper rockets. - Titebond's biggest drawback is drying time and shrinkage. The shrinkage is a real pain when you want good looking fillets. - Epoxy itself is very brittle, its the additives that make it strong. Some epoxies have additives already included for strength, others need to be used with structural fillers like carbon fiber or fiberglass. - Some epoxies are strong because of their ability to soak into the materials you are bonding, essentially use the material itself for strength. Well, Kirk, I've used Elmer's in the past, and I'd guess the results would be similar to the Titebond II. Titebond is what I have, and it's what I prefer. Not for any particularly good reason - it's just my preference. But I don't plan on going out and buying every brand of glue for an informal test like this. I try to be as thorough as I can, but I'm only going to do so much. Perhaps if I made my living by blogging, then sure, I'd do that. But this is a hobby for me. I do this for free, in my spare time, to share what I've learned with those who are interested. As I stated in the blog, you should feel free to test out your favorite brands at home. That's why I was so detailed with what I did here - so you could replicate it if you wanted to. Really enjoyed watching your video. With the music punctuating the scenes, and the occasional sped up action, it was almost comical seeing "Mr. Hands" switch out the various glue bottles, to announce which product we were about to see demonstrated. Good job!